Coll. No. 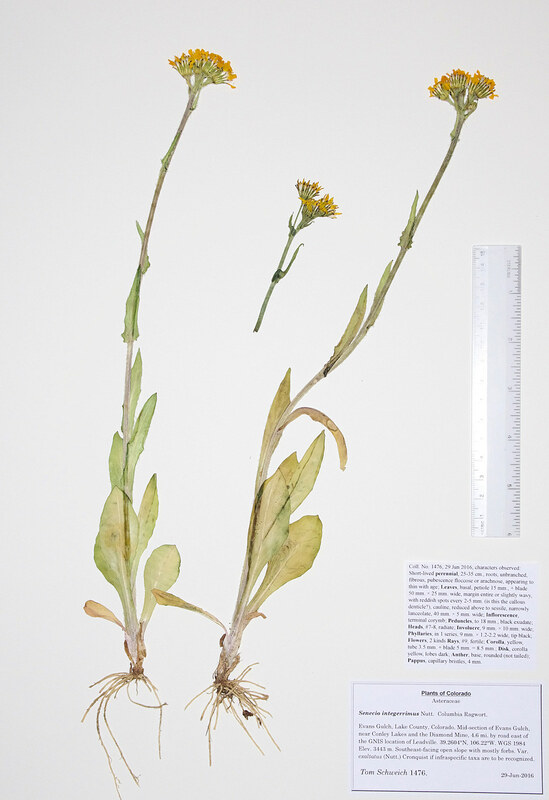 1476, 29 Jun 2016, characters observed: Short-lived perennial, 25-35 cm., roots, unbranched, fibrous, pubescence floccose or arachnose, appearing to thin with age; Leaves, basal, petiole 15 mm., + blade 50 mm. × 25 mm. wide, margin entire or slightly wavy, with reddish spots every 2-5 mm. (is this the callous denticle? ), cauline, reduced above to sessile, narrowly lanceolate, 40 mm. × 5 mm. wide; Inflorescence, terminal corymb; Peduncles, to 18 mm., black exudate; Heads, #7-8, radiate; Involucre, 9 mm. × 10 mm. wide; Phyllaries, in 1 series, 9 mm. × 1.2-2.2 wide, tip black; Flowers, 2 kinds Rays, #9, fertile; Corolla, yellow, tube 3.5 mm. + blade 5 mm. = 8.5 mm. ; Disk, corolla yellow, lobes dark; Anther, base, rounded (not tailed); Pappus, capillary bristles, 4 mm. Field Notes: Coll. No. 1476, 29 Jun 2016.